Possibly one of the most important commitments of a small business is to never look back, but to always move forward with only the smallest of rearview mirrors as a reminder of where you’ve been and what has gotten you to where you are. However, if there is ever a time to slow down, the last weekend of every year is certainly an acceptable time for positive reflection on another year gone by. 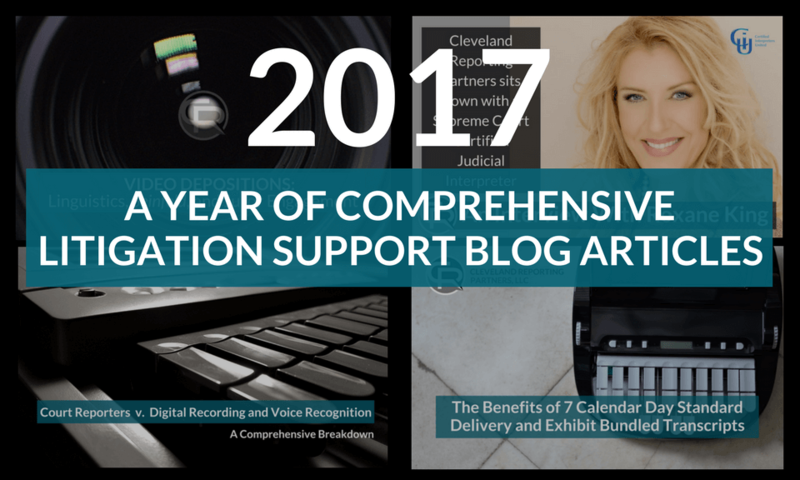 Cleveland Reporting Partners enjoyed substantial growth in 2017, and the creativity, innovation, experience and expertise we offer in the realms of court reporting and litigation support was on display throughout the year in the blogs we wrote and published. So before that frigid ball drops on Times Square in a few days and we look forward to what’s to come in 2018, let’s take a look back at the informative, comprehensive CRP blog articles of 2017 with brief descriptions and accolades. The threats of technology and AI on the American workforce were all over headlines in 2017, and the legal industry was no exception. Court reporters have been threatened by emerging technologies since the advent of the tape recorder; but are any of these threats really credible? In this article, the incredibly sophisticated technology used by court reporters to capture spoken language is explained in great detail, and then compared and contrasted to the technologies of digital recording and voice recognition. 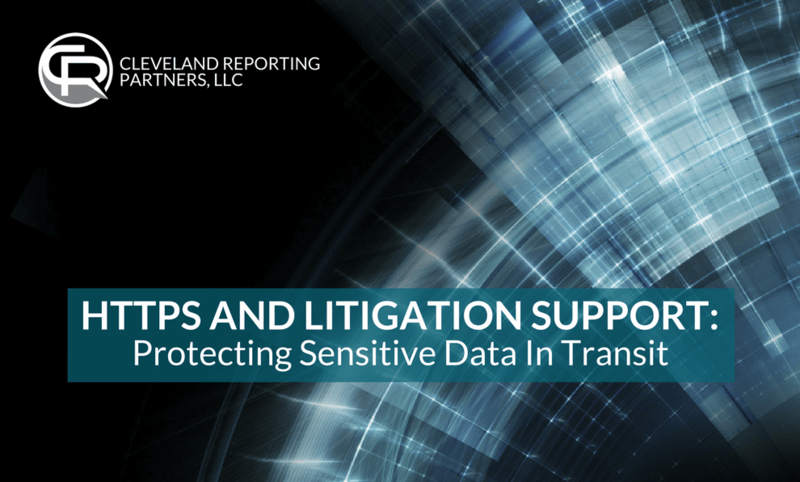 CRP received many emails from court reporters and litigation support firm owners around the world in support of this article, and it was shared over 3,000 times on social media. 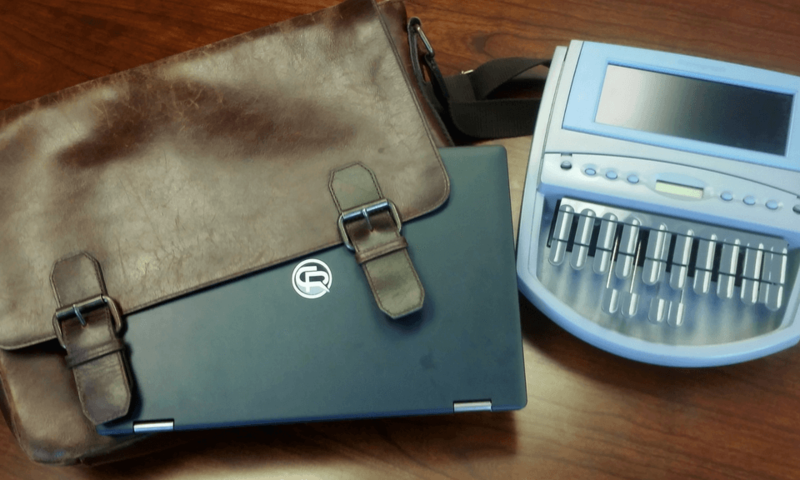 It was featured nationally by the National Court Reporters Association, and got CRP co-founder and author Todd L. Persson an invite to speak about court reporting technology and the future of court reporting on the Stenographer’s World Radio national podcast. An abridged version of this article was also published in the October 2017 issue of the Cleveland Metropolitan Bar Journal. As court reporters, we often work side-by-side with interpreters to capture and preserve the record in depositions and trials that involve non-English speaking parties or witnesses. However, ensuring due process and justice takes so much more than just fluency in a source and target language. 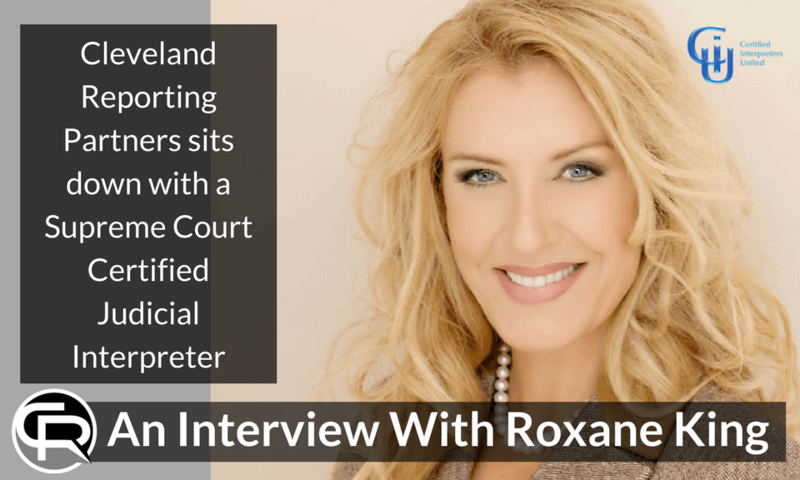 In this article, CRP sits down with Supreme Court Certified Judicial Interpreter, Roxane King, to learn all about the training, education and experience that is needed to stop a deposition or trial involving an interpreter from turning into a nightmare. This article was featured nationally by the National Court Reporters Association and the American Translators Association. An abridged version will be published in the January 2018 issue of the Cleveland Metropolitan Bar Journal. There is a tremendous difference between written and spoken language. 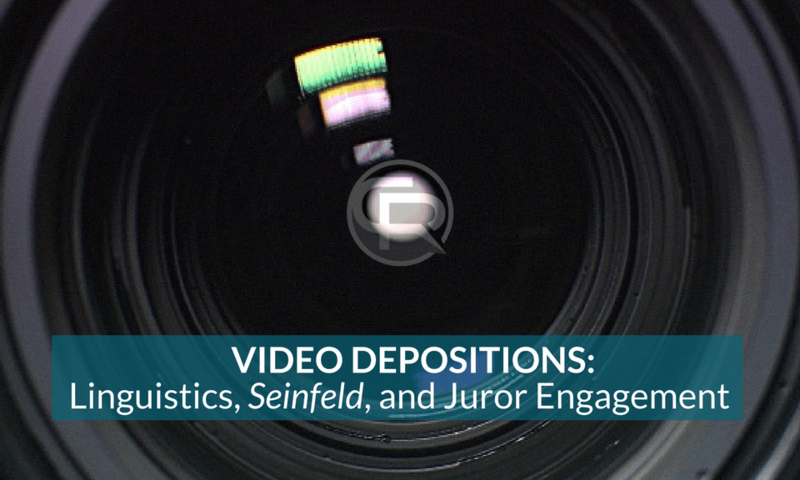 In this article, CRP delves deeply into the bizarre world of linguistics and pop culture, using examples from Seinfeld, My Cousin Vinny, as well as the principles of The YouTube Effect, to explain the importance of capturing discovery testimony with video to combat juror disengagement. This article was featured nationally by the National Court Reporters Association. 2017 saw the introduction of Senate Joint Resolution 34 (H.Res.230) in which the House voted to repeal the broadband privacy regulations introduced in 2016 that prohibited Internet Service Providers from selling private browser activity to the highest bidder, or to anyone whatsoever. Politics aside, this certainly made the Internet a less private place to spend your time, and the security of HTTPS encryption on websites became even more important. In this article, CRP discusses how data is transferred from a user to a website, some basics of encryption and site security, and what you need to look for in the litigation support you work with to ensure any sensitive data you may be sharing with them over the Internet is protected while in transit. When we talk about digitally signed transcripts, we are talking about much more than just an electronic, cosmetic image of a signature. 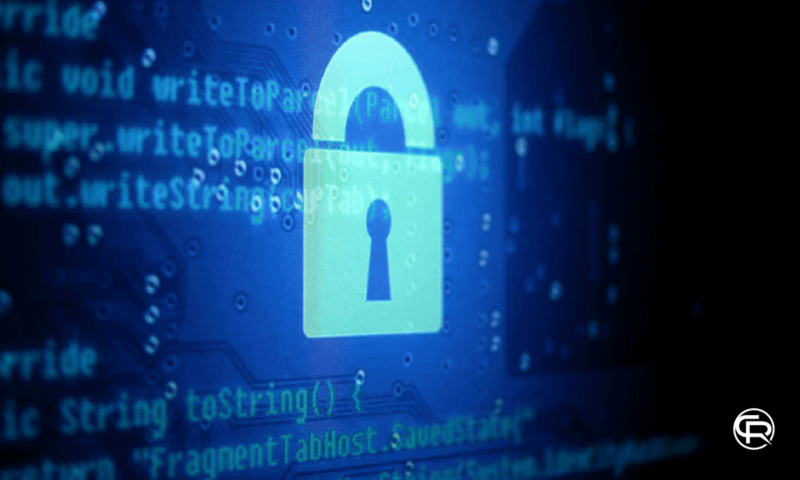 Data security is so important in today’s society, and electronic documents in litigation are no exception. In this article, CRP discusses the very big difference between an electronic signature and a digital signature, and how to tell if the transcripts you are receiving from your court reporter are encrypted with a digital signature footprint to protect against corruption and/or wrongdoing from a malicious user. 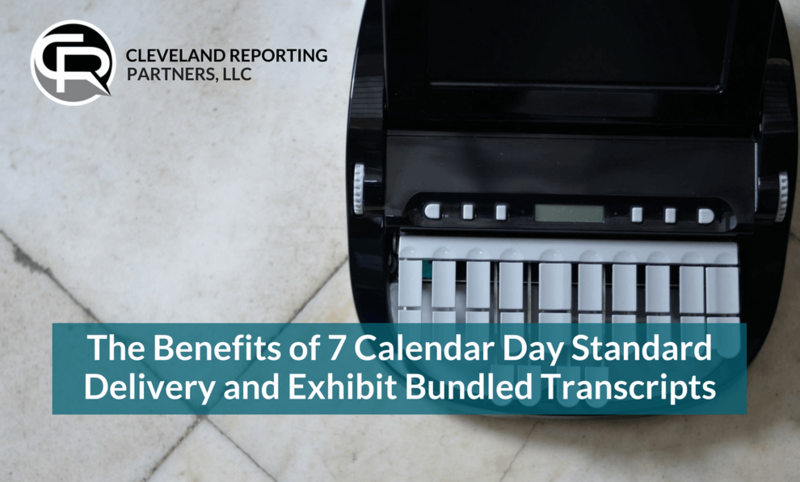 In today’s fast-paced world of civil litigation, two-week standard delivery times and non-functional PDFs from your court reporters may be slowing you down. The good news is there are more efficient litigation support firms out there with a more modern philosophy. In this article, CRP discusses the advantages of working with court reporters and litigation support who put a greater emphasis on efficiency and who offer highly functional transcripts as standard. Although originally published by CRP in late 2016, every aspect of this article applied in 2017, and will continue to apply into the future regarding what you should expect from a modern-day, progressive court reporter. 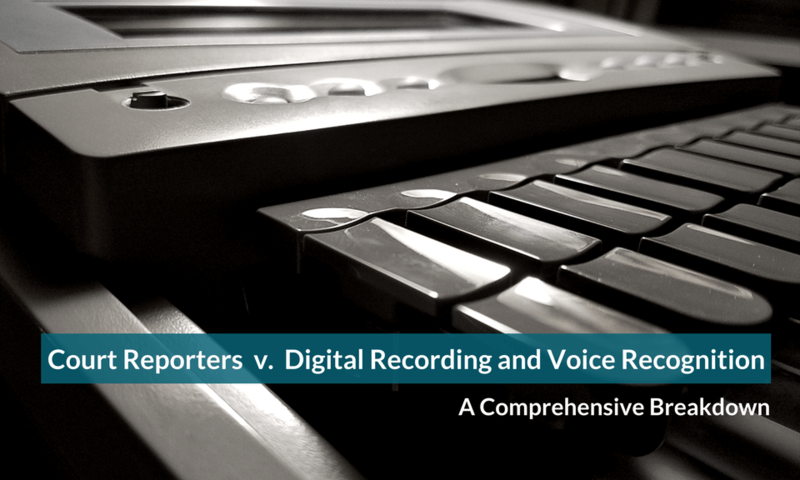 In this article, CRP discusses 9 attributes of exceptional court reporters who demonstrate a complete understanding and respect not only for the preservation of the record, but for the entire discovery process itself. CRP received many emails of praise for this article from court reporting instructors around the country, and it was featured in the 2017 Summer Edition of the Florida Court Reporters Association Newsletter. It is CRP’s mission to create value for our clients not only in the products and services we provide, but also in sharing our knowledge and experience in the industry we work in and care so deeply about. We will continue to operate with a modern litigation support philosophy in 2018 with a focus on efficiency, responsiveness, and endurance. We would like to thank all our clients who made 2017 such an amazing year, and we look forward to seeing you out in the field in 2018! Happy New Year from all of us at Cleveland Reporting Partners! !